The $166 bln industrial group is exceeding revenue estimates and planned merger cost cuts. Crunching two companies together and splitting into three should be worth more, according to activist Dan Loeb last year. He has gone quiet – and investors seem to have forgotten the story. 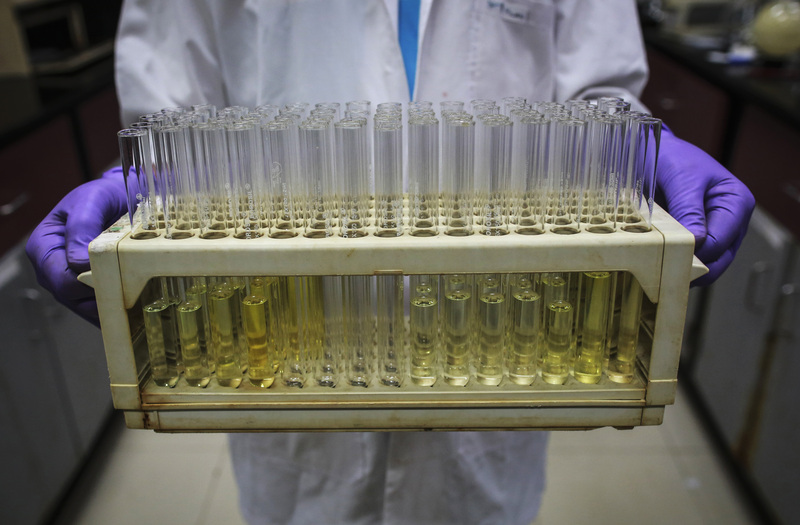 An employee carries test tubes inside a laboratory at Piramal's Research Centre in Mumbai August 11, 2014. DowDuPont on Feb. 1 reported fourth-quarter net sales of $20.1 billion versus comparable net sales of $17.7 billion a year earlier, topping analysts’ estimates. In the first full quarter as a combined company, the chemicals group said cost savings from the merger were exceeding expectations. The company said it now plans to save $3.3 billion annually, up from the $3 billion it had previously estimated. At the same time, the chemical company said it expected earnings per share to grow in the mid-to-high teens, lower than market consensus, according to a Reuters report citing Cowen analysts. The merger of Dow Chemical and DuPont became effective on Aug. 31, 2017. Three months earlier, activist investor Dan Loeb’s Third Point published an analysis suggesting how the combined company could create additional shareholder value from its planned split into three. DowDuPont shares closed on Feb. 13 at $70.75.